The University of Georgia GymDogs won their 7th national championship in Women's Gymnastics, and 2nd in a row. This year was particularly impressive, as they went the entire season and postseason undefeated during which they played and defeated every other school ranked in the preseason top 10. A really impressive feat, that. If you really want to dork out you can see Mayor King's meticulous coverage here, here, and here. In addition, freshman Courtney Kupets won two individual national championships in both the balance beam and uneven bars. Actually, make that three - she was declared the All-Around Champion as well. That makes 28 individual national championships to go along with the 7 team titles. And they do something the men's basketball team wishes they could do: put 10,000 asses in Stegman Coliseum seats for their home meets. Oh, and the picture below reminds me that while I was in Grad School for Sports Management, my classmate A.J. had the best job ever: trainer for the GymDogs. National Champions. And cute, too. 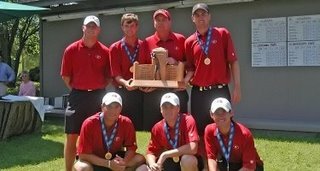 University of Georgia's #1 ranked and defending national champion Men's Golf team won the SEC Championship for the 3rd time in the last six years. The best part is that they beat #3 Florida by a single stroke. Georgia shot a 13-under 827 and were 11-under 269 in the final round. NCAA Regionals wil be May 18-20, and Georgia should advance to the NCAA Championship at Crosswater Golf Club in Sunriver, Oregon May 31-June 2 to defend their title. 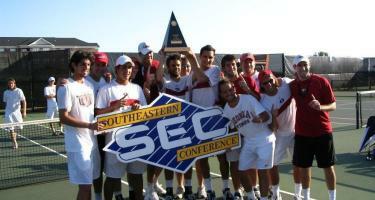 University of Georgia's #1 ranked Men's Tennis team added the SEC Tournament Championship to their regular season SEC title by coming from behind to defeat Ole Miss in the finals. The Men's tennis team is a perfect 25-0 this season and will enter the NCAA Tournament as the top seed. 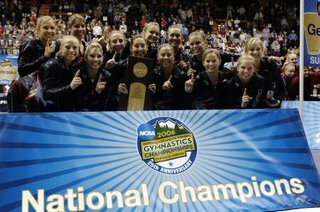 The Gymnastics title is Georgia's 11th national championship since 2000. Although many Georgia fans would trade all 11 for a "national championship" in football, it is still cool that our school continues to excel in so many sports, even if they are of the "olympic sport" variety.